Duke Energy’s Top of the World wind power project in Wyoming faced some severe weather challenges—with minus 30 degree temperatures—and an inflexible deadline for getting material to the site, due to an Interstate bridge construction project. But the project was completed on time. The past year was a busy time for wind power projects for major utility Duke Energy. In fact, the company was so active with projects that it will soon be hitting a milestone: 1,000 MW of wind power under production. Pretty good, considering the company has only been involved with wind power in a big way for a few years. In late November, the company brought the 51 MW Kit Carson wind power project in Colorado online, giving it 986 MW of wind capacity at nine wind farms in four states—Wyoming, Texas, Pennsylvania, and Colorado. Since 2007, Duke Energy has committed some $1.5 billion to build its wind power business. “The remarkable growth of our commercial wind energy unit over the last three years illustrates our commitment to building a significant emissions-free power generation business,” says Keith Trent, president of Duke Energy’s commercial business. A big contributor to moving toward that 1,000 MW benchmark was the completion this past fall of the 200 MW Top of the World wind project, in Wyoming, the second largest wind power project the company has ever built. It is also the largest wind farm Duke has built in the state. 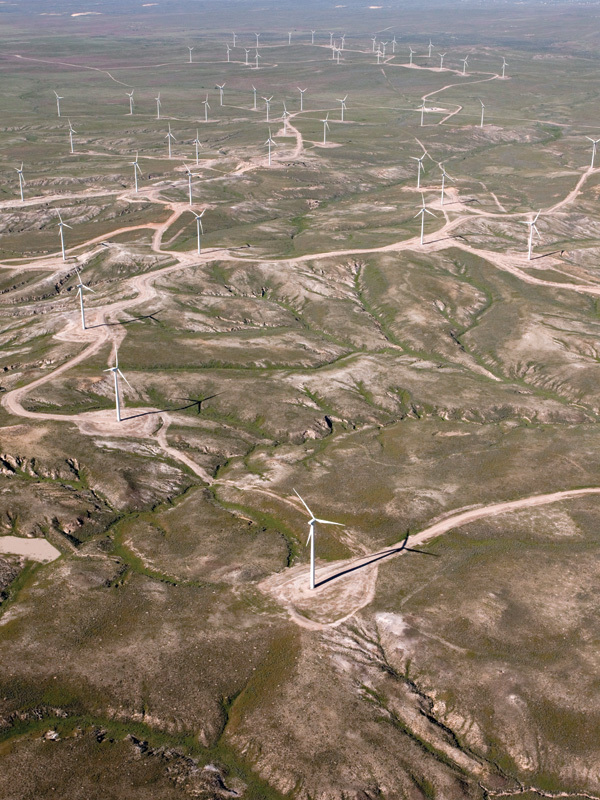 The company now has four wind farms in Wyoming. The project supplies wind energy to regional utility Rocky Mountain Power under a 20-year Power Purchase Agreement. Rocky Mountain now has 1,100 MW of wind power, and the company says it is on track to achieve their objective of having 2,000 MW of renewable power in place by 2013. The Top of the World location has a number of clear advantages that made it a prime site for development, says project manager David Grogg. There is indeed good wind at Top of the World. “Top of the World is viable in terms of our economic model—the wind blows at a rate and consistency that can support a project for 20 to 25 years,” notes Grogg. A third major advantage—and a valuable advantage at that, in a time of NIMBY-ism—is that the project has local support. Additionally, Wyoming is an attractive state for wind development, though that may change in the future due to new tax regulations (see sidebar story on page 28). There’s nothing like getting the Presidential seal of approval for your wind project components. One of the turbine blades on Tower 90 of the Top of the World project was inspected by President Barack Obama during his visit to the new Siemens manufacturing facility in Fort Madison, Iowa, back in April 2010. Siemens supplied 44 of its 2.3 MW turbines for the project. GE supplied 66 of its workhorse 1.5 MW units. The plant, which Siemens opened in 2007, employs 600 people in Fort Madison and can turn out 16 wind turbine blades a week. Top of the World is indeed a massive project, being located on 17,000 acres of private land under lease in Converse County, in the eastern part of the state. The nearest major center is the city of Casper, just to the west. Most of the land for the site is used for sheep and cattle ranching. There is also a fair bit of hunting that goes on. As developer of the project, Duke Energy had to deal with only four landowners in negotiating land leases. The landowners viewed the project positively, seeing it as an additional source of revenue in addition to the ranching and hunting activities—and the fact that a wind farm would not interfere with either. 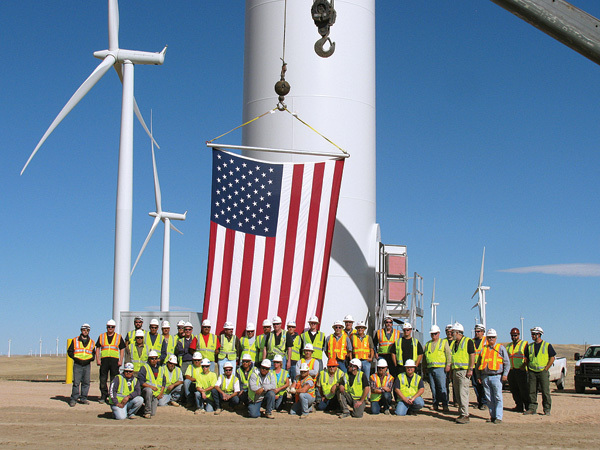 Getting all the 200 MW of wind components to the site was helped by the good transportation infrastructure in Wyoming. “The State has a strong rail network that allowed us to get the materials to a centralized point,” says Grogg. “We had a laydown yard, near the Casper Airport, to bring in the blades and the nacelles.” Having rail access was especially helpful since many of the components came from various parts of the U.S. and overseas. The nacelles for the GE turbine units, for example, came from North Carolina, and the blades for the Siemens turbines came from a new plant in Iowa. Components travelled about 40 minutes by truck on the Interstate highway, to connect up with the road network for the wind project. It’s at this part of the process that the logistics people at component suppliers such as GE and Siemens play such an instrumental role. Grogg notes that logistics people work closely with local, regional, and state government agencies to ensure the proper routes and permitting, for the extremely heavy and large wind turbine component loads. The routes, in particular, are meticulously planned out. The most efficient routes are carefully selected, so trucks don’t have to travel miles out of their way to avoid bridges that might have height or weight restrictions. Duke Energy, Wanzek Construction, and Siemens employees proudly assemble beneath Tower 90 at the Top of the World Windpower project. One of the wind turbine blades atop Tower 90 was inspected by President Barack Obama at the Siemens manufacturing facility in Fort Madison, Iowa (see sidebar story on page 27). This, and other major aspects of the Top of the World project, were covered by kind of a blanket legislative act in Wyoming, called the Industrial Siting Act. Applying to any project with a value of over $173 million, the act covers virtually all aspects of major projects, from transportation to the environment, the impact on local roads, and details such as where construction workers are going to live and how they are going to get to the work site. One approach that Duke took to reducing the impact of the project was particularly interesting. Under the agreement, Duke took detailed before and after photographs of the roads that were used to transport equipment. If there was any damage to the road, Duke agreed to return it to its original condition. “We really felt that we owed it to the county or the state—if we damaged the road, we would fix it,” says Grogg. They had some heavy loads on those roads; nacelles, for example, weighing in at 192,000 pounds. As part of this process, Duke paid for a $100,000 asphalt patch at the entrance to the road to the wind farm, which received a good portion of heavy traffic. Throughout the process, Grogg made himself very available to the Wyoming Department of Transportation (WYDOT) staff to answer any questions and settle any issues. He was, essentially, the point person for the project. Overall, Grogg said that Wyoming’s Industrial Siting Act was helpful from both the planning and construction perspectives, in that it makes it clear what Duke Energy and its contractor on the project, Wanzek Construction, were expected to do. The one unexpected aspect to the Top of the World project, as with all wind power construction projects, was the weather. As some of the residents say, Wyoming can get plenty of weather. In Wyoming, roads and transmission lines can be built without a permit, so Wanzek Construction started in on both in early November 2009, in advance of receiving a project permit. As scheduled, they received the permit in January, so they were carrying out the prime part of construction in -30 degree temperatures. They had their share of weather days, when the project was shut down due to high winds or extreme cold. “We know when our equipment can run, and when it shouldn’t be run—and when it gets too cold, we stop,” says Grogg, matter-of-factly. Construction and any other contractors involved would have a POD (Plan of the Day) meeting that would define what was going to be happening that day. A tax on wind power in Wyoming? Wind energy producers could face wind taxes in Wyoming in the not too distant future. Wyoming’s Legislature passed a bill in 2010 that (beginning January 1, 2012) would impose a $1-per-megawatt-hour tax on wind energy projects that have been in operation for three years—that is, unless there are changes to the legislation in the 2011 session. Wyoming’s would be the first state tax on wind energy generation in the U.S., and it comes just as the state sales tax moratorium on wind turbine components expires on December 31, 2011. Wyoming wind developers will then have to pay up to six percent sales tax on every piece of their multimillion-dollar turbines. The wind power industry, understandably, is not happy about this situation. “It is very disturbing to hear that one of the great states for energy resources wants to further tax the industry and discourage the development of new jobs in their state,” said American Wind Energy Association CEO Denise Bode. Wyoming currently has 1101 MW of installed wind energy and is ranked as number eight among all U.S. states for wind power potential. If implemented, the tax could influence future wind power development in the state. They would end the week with meetings, to ensure they were on schedule. Then there would be monthly meetings, which would involve a larger group of people including other Duke Energy representatives, from the head office in Charlotte, supplier representatives, and any other necessary parties. While Duke Energy was working to have the project completed by fall 2010, there was one major time element that was completely out of their control—and it was a major challenge, says Grogg. WYDOT had a firm date for construction work on a bridge on the major Interstate highway, I-95, that led to the site. That work was starting August 1—no ifs, ands, or buts about it, which meant that all of the material for Top of the World had to be across the bridge before August 1. “If materials weren’t across by August 1, well, they weren’t going to get to the site,” said Grogg. Again, this involved the logistics people making sure everything was delivered to the ports—if the components were coming from overseas—and to rail depots, so the August 1 deadline could be met.